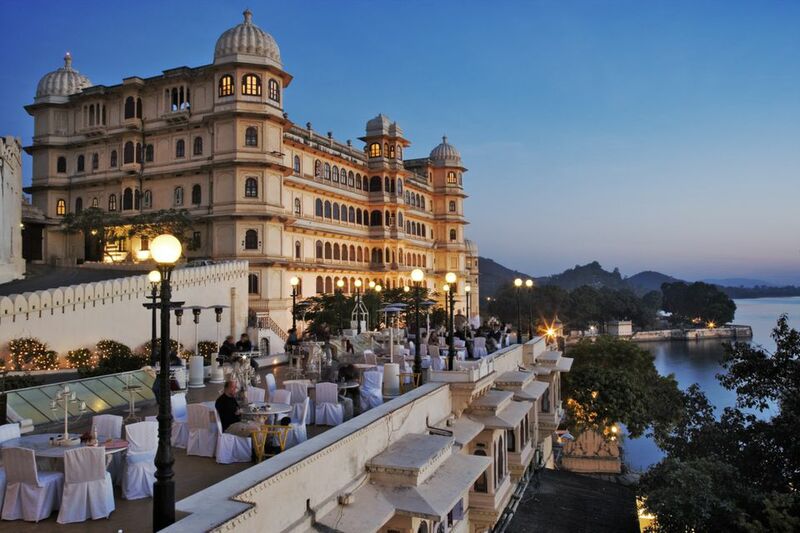 The Fateh Prakash Palace hotel is the smaller of the two authentic palace hotels in the Udaipur City Palace Complex. Also built in the early 20th century, it's named after Maharana Fateh Prakash who reined during its construction. Originally, the Fateh Prakash Palace served as an exclusive venue for royal functions, where the Maharanas of Mewar held court. Today, the hotel continues to host exclusive ceremonial dinners and corporate events. Still owned by Udaipur's Mewar royal family, the Fateh Prakash Palace is one of their HRH Group of Hotels, located throughout Rajashtan. It's a regular National Tourism Award winner for best heritage hotel in the "Heritage Grand" category. The Fateh Prakash Palace hotel isn't as famous as its counterpart, the Shiv Niwas Palace hotel, but what makes it so special is what's inside it. It houses an invaluable collection of royal artifacts, weapons, crystal, and portraits. Take this visual tour of the Fateh Prakash Palace hotel to discover some of its treasures. 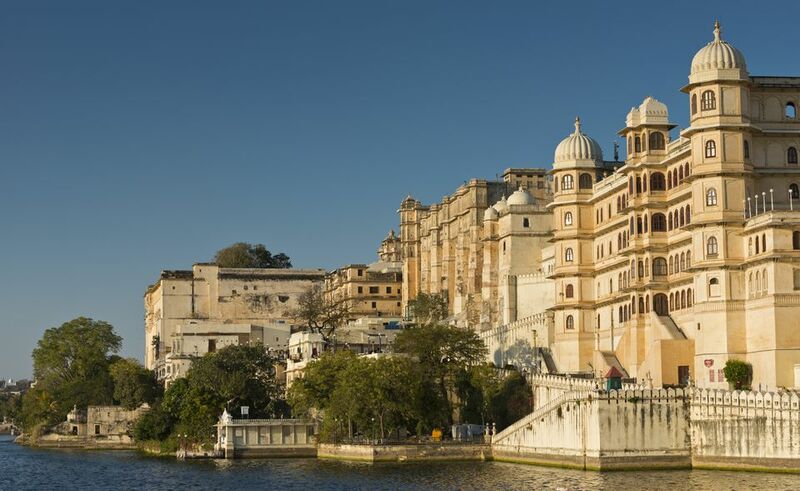 The Fateh Prakash Palace hotel is situated at the northern end of the City Place Complex, almost directly opposite Udaipur's most famed building -- the Lake Palace Hotel, in the middle of Lake Pichola. This affords an unrivaled view of the hotel and the lake. The hotel capitalizes on it well, particularly so with the positioning of the Sunset Terrace bar and restaurant. The hotel also enjoys a central location between the Shimbu Niwas Palace, where the Mewar royal family lives, and the City Palace Museum. However, unlike the Shiv Niwas Palace hotel, the Fateh Prakash Palace hotel doesn't offer any Udaipur city views. Its appeal comes from its proximity to the lake. Being the smaller of the two palace hotels, the atmosphere inside the Fateh Prakash Palace hotel is cocoon-like, rather than open and expansive. The hotel is also spread over two wings, in separate buildings, which makes it feel a little fragmented. The Fateh Prakash Palace hotel doesn't have a swimming pool, but if you do feel like going swimming or simply relaxing poolside, guests are welcome to use the pool at the Shiv Niwas Palace hotel free of charge. A great benefit of staying at the Fateh Prakash Palace hotel is that guests are allowed to freely roam around the City Palace Complex (with the exception of going inside the royal residence), so you can feel right at home! Golf carts are provided for those who don't want to walk. The accommodations at the Fateh Prakash Palace hotel were upgraded in 2011. They consist of 21 Dovecote Rooms and 44 Dovecote Premier Suites. The elegant Dovecote wing has been newly constructed as an extension to the palace. Its rooms are modern, most face Lake Picola and the Lake Palace Hotel, and many have their own balconies. However, they're not part of the original palace. Rates start from about 8,000 rupees for a double Dovecoat Room, including tax, during the summer and monsoon season. Dovecoat suites cost upwards of 17,000 rupees per night including tax. During the peak winter tourist season, from October to March, rates jump to about 16,000 rupees upwards including tax for a Dovecote Room and 36,000 rupees upwards including tax for a Dovecote Suite. The additional cost of breakfast is 1,500 rupees per person. Read traveler reviews and compare prices on Tripadvisor: Fateh Prakash Palace hotel. As the sun sinks down behind the mountains, the open air Sunset Terrace at the Fateh Prakash Palace hotel becomes the heart of the City Palace Complex. People flock there to have a drink, and watch Lake Pichola and the Lake Palace hotel be bathed in colorful hues. The view is superb. In fact, the Sunset Terrace is the best place in the whole City Place Complex to see the Lake Palace Hotel. The experience is high on romance, so if you are in Udaipur with a loved one, don't miss spending an evening at the Sunset Terrace. You'll be able to enjoy live music as well. Sunset Terrace is open all day, from 7 a.m. until 10.30 p.m. The menu is mixed, with a range of Indian, Chinese, and Continental cuisine to choose from. The hotel's Surya Darshan Bar serves English Afternoon Tea from 3 p.m. to 5 p.m., and also offers sunset views. Of course, guests can also eat and drink in the many other restaurants, scattered throughout the City Palace Complex. One such place is the European-style cafe, Palki Khana, in front of the City Palace Museum. The Pool Deck at the Shiv Niwas Palace Hotel is another delightful place to spend a romantic evening outdoors. The focal point of the Fateh Prakash Palace hotel is the imposing Durbar Hall, which was used for royal audiences. The foundation stone was laid by the Viceroy of India, Lord Minto, in 1909. The hall was originally called Minto Hall in his honor. These days, Durbar Hall is used as a banquet hall and hired out for special functions. Passengers from the Palace on Wheels luxury train dine here when visiting Udaipur. As soon as you enter Durbar Hall, it's impossible for your attention not to be captured by the seven crystal chandeliers suspended from its ceiling. The centerpiece is a mammoth chandelier weighing one tonne. Its brilliance dominates the whole room. Two slightly smaller chandeliers, weighing 800 kilograms each, flank its sides. There are another four smaller chandeliers, weighing 200 kilograms each, in the corners of the hall. The dramatic ambiance of the Durbar Hall, which easily transports you back in royal history, is enhanced by the grand portraits of the Maharanas of Mewar that grace its walls. There are plenty of historic artifacts on display, including royal weapons, as well. Look upwards and you'll see the viewing gallery that borders the hall. This is where the women of Rajputana stood, out of sight, to watch the proceedings in the hall. The Durbar Hall is open from 9 a.m. until 6.30 p.m. If you're a guest of either the Fateh Prakash Palace hotel or Shiv Niwas Palace hotel, you can see it for free. Otherwise, entry comes with a ticket to visit the Crystal Gallery. The Crystal Gallery, which overlooks the Durbar Hall at the Fateh Prakash Palace hotel, is probably the largest private collection of crystal in the world. It certainly is extensive, and contains some incredible pieces. Among them is a crystal footrest (pictured above), and the only crystal bed in the world. If that isn't indulgent, I don't know what is! The custom made collection of crystal was created especially by F & C Osler for the young Maharana Sajjan Singh, who began his reign in 1874. Sadly, he died prematurely 10 years later, and never got to see many of the pieces. The abandoned crystal lay packed away in boxes until recent years. Then, the current head of the Mewar royal family, Shriji Arvind Singh Mewar, decided to display it to the public. The Crystal Gallery was opened in 1994. The Crystal Gallery can be viewed from 9 a.m. until 6.30 p.m., daily. At 700 rupees per adult and 450 rupees per child, it's not cheap though, unfortunately.